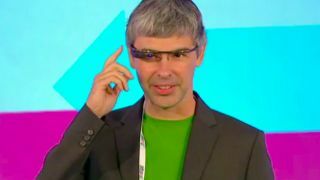 Larry Page: "It's Glass, because it's only one." Google CEO Larry Page has offered a small audience of UK tech fans their first in-the-flesh glimpse at the Project Glass Augmented Reality specs. Page showed up on stage at the Google Zeitgeist event in London sporting a pair of the glasses currently being developed by the company. The chief exec pointed out the tech is still in its early stages, but was still able to use a physical camera button near his temple to snap a shot of the attendees. He also combined a head movement and a tap on a touch-sensitive panel in order to share the picture with others, although this may have been just for show. "These are obviously Google Glass, it's only Glass because it's only on one side," Page told the audience. "It's still in a bit of an early stage but I'm really excited to be able to have one. And to have it working. … It doesn't yet show me all of your names, but I'm really glad that you're all here." Page's public Project Glass fashion show, which you can see in the video below, comes after his co-founder Sergey Brin also stepped-out wearing a prototype pair. It seems the pair are pretty excited about this one.